Tap​ ​into​ ​the innovative world of augmented reality retail. Invite customers to virtually try on your costumes and cosplays before they buy. 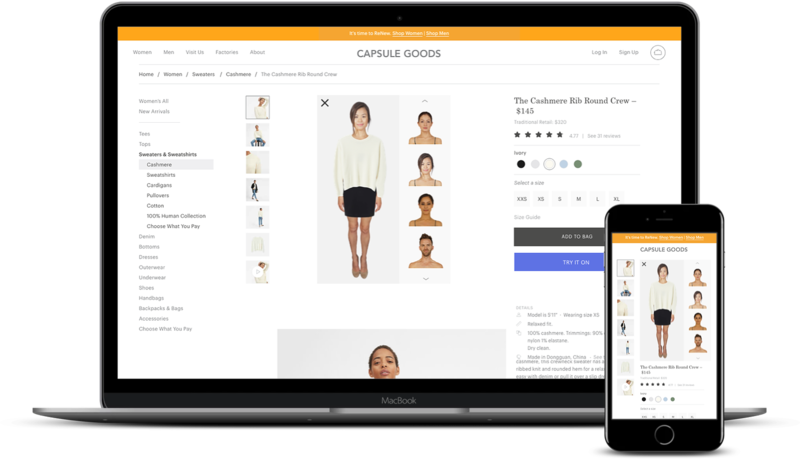 With Headwink, shoppers can upload an image of themselves and see what they look like in your latest creations. Then click out to your store to make an immediate purchase! 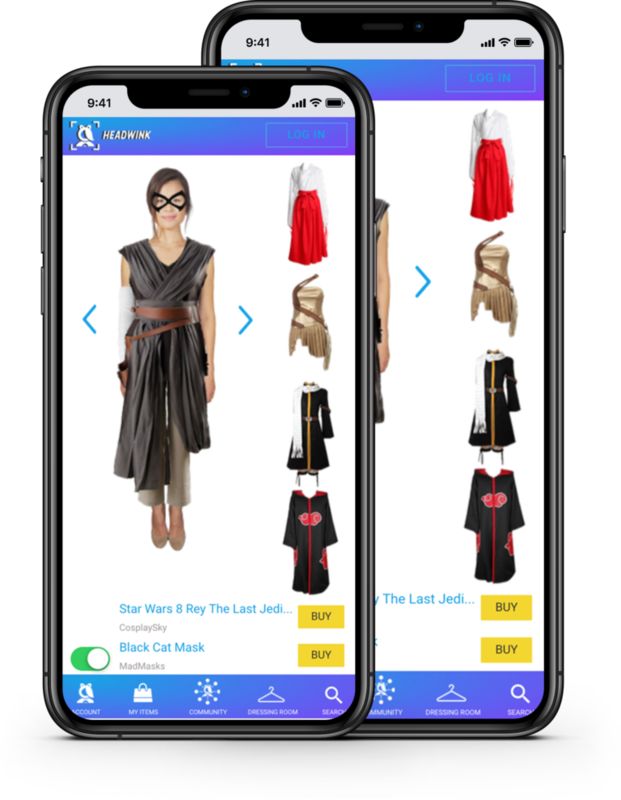 Increase your online sales with the first augmented reality shopping experience for cosplay! With​ ​a​ ​quick ​swipe, showing ​and​ selling​ ​your​ pieces​​ is​​ ​easier​ ​than ever!​ ​There are lots of ways to work with us! How Can Headwink Help Grow Your Business? Invite customers to virtually try on your costumes and cosplays before they buy. Sell your items in our store with our try on tool. Get started today! We are social media and influencer marketing pros. Tap into our expertise to grow your brand! Huzzah! Embed our virtual try on tool with just one line of code! With just a few clicks let your customers quickly try your items on any model they choose. Make shopping on your site fun and help customers imagine themselves in your products! Expand your reach by tapping into our social media following of over 20k! The Headwink Sponsorship Hub connects businesses with cosplay social media influencers for promotion opportunities. Connect with engaging cosplayers for item reviews, social media campaigns, convention representation and more. Our Sponsorship Hub makes influencer marketing easy. We have dozens of cosplay influencers ready to work with your store now! Leverage our Sponsorship Hub to coordinate a campaign and reach over 900k social media users! This package is ideal for anyone starting out their business or just getting their feet wet with the online presence of their business. With this package, one of our social media marketing professionals will help you strategically plan an entire month’s worth of content, keeping in mind key dates (such as conventions, movie releases, etc.) that will allow you to push your product to appropriate markets. Are you ready for your business to takeoff? Well we are here to help with the Ready for Takeoff package. This package will include a weekly phone call, advice on social media advertisements, & we will create 1 post per week for you. Advice on advertising, where to spend budget and how to reach ideal audience. *Management of ads can be added for small additional price. So your business has already taken off but you still need that extra boost to put your business on the right path, the Booster Package is right for you! The Booster Package is designed to boost your social media presence to the next level. With multiple posts per week across your platforms, your business will start gaining the attention it has always deserved. Managing audience responses including reviews, comments and questions using comments, “likes” and “shares”. Answering any questions regarding the business and how it works. Creation of various ad styles including carousel, videos, etc. As businesses grow, there comes a point where it is impossible for the business owner to “do it all”, and that’s where the empire package comes in. The Empire Package allows you to continue building the empire that is your business, while our team takes over your digital empire, or social media presence. With this package, you will no longer need to spend large amounts of time planning strategic content and creating ads because our team will take care of that for you! Up to 5 original, engaging posts per week will be provided by the service provider. The Client can also request promotion of sales, giveaways or particular products/services. Managing audience responses including reviews, comments and questions using comments, “likes” and “shares”. Answering any questions regarding the app and how it works. When your brand is ready to take over the whole entire galaxy, we’ll be right by your side to help! With this package, our team will be working 7 days a week to keep your online presence in tip-top condition. With daily postings and story updates, you’ll be sure to stay on the forefront of your potential customers’ minds leading to more social engagement and ultimately, more sales. Optimization of the Client’s Instagram account with consistent imagery to facilitate online branding. Grow follower base using industry and location specific hashtag research adding unique users, engaging users with likes, comments and handle mentions. Instagram Ad management utilizing Facebook Ad Platform and targeting.